The appearance of your mattress will change very little, if at all. This FREE adjustment is only available once. Because of our extensive experience, we know that it takes time to get accustomed to a new mattress. Therefore, we ask that you sleep on your new mattress for at least 14 nights before asking for your one-time free adjustment. If after 14 nights you would like to have your mattress made either firmer or softer, please contact the Yankee Mattress Factory store where you purchased your mattress. 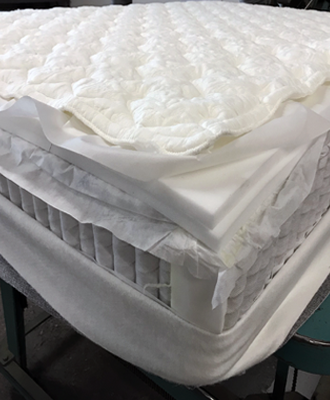 When you contact your Yankee Mattress store, we will schedule a date and time for you to drop your mattress at our factory in Agawam, MA, for reupholstery. We recommend using a protective mattress bag during transport to avoid soiling or damaging your mattress. We can provide a bag free of charge. Please let us know that you will need one when you call. If you drop your mattress off in the morning of a regular work day, Monday through Friday, we can usually have the adjustment completed by that same afternoon. All materials and labor costs involved with this adjustment are provided at NO COST to our customer. This is truly a FREE service and we want to keep it as such. However, if you are unable to transport your mattress to our factory, we would be happy to provide delivery for an additional fee. This service would include pick-up of your mattress, transportation to our factory, and re-delivery back to your home. Due to the amount of labor and delivery time required for this service, we ask that you plan to be without the mattress for at least one night.